Home › Dirty Politics › People’s Association still relevant? Editor’s Notes: The explanation given by Lim Boon Heng borders on self indulgence. Why not appoint some grassroot leaders as Chairman and Vice Chairman instead of PM Lee and Lim Boon Heng? the opposition leader was right that PA should be scrapped as it is a waste of public moeny and its irrelevance in modern days like ours, the new citizens likely to rely on internet and newspaper/TV rather than PA. How many new citizens go to PA’s activities? Ask yourself, how many times have you gone to the CC or participate in PA’s activities? My guess is less than 10% of the population. Even if the Government wants to keep it, it should remain non-partisan and should not be used by or associated with any political party at all as is the current case where PA is seen strongly associated with the PAP. Mr Lim Boon Heng yesterday defended the work of the People’s Association (PA), after an opposition leader on Sunday called for the grassroots organisation to be scrapped.Mr Low Thia Khiang had argued that the People’s Action Party’s links to the PA – Mr Lim Boon Heng is PA deputy chairman, while Prime Minister Lee Hsien Loong is PA chairman – give the party an unfair advantage in getting support from voters. Responding to Mr Low’s charge, Mr Lim said that the work of the PA, whose original objective was to bring together Singaporeans of different races, religions and dialects, was not yet done. The work is ‘never-ending’, Mr Lim said, because Singapore is a country where there is constant change. Furthermore, the PA today “has an added task of integrating those who have decided to make Singapore their home”, Mr Lim said. “So, this is a very important task – it’s got absolutely nothing to do with politics or supporting the PAP,” he added, with fervent emphasis. I REFER to Monday’s report (‘PM: Unfair to criticise grassroots activists’). Being a grassroots volunteer myself, I could not help but feel that debating whether the grassroots activists are telling MPs the truth is just barking up the wrong tree. There is simply no incentive for grassroots activists to tell MPs things they like to hear. Unfortunately, grassroots activists have to face the reality of often being misunderstood, suspected of and sometimes even ridiculed for serving only the ruling party, rather than the people. For grassroots organisations to be relevant and credible, there is a dire need for them to be dissociated from all political affiliations. As a politically neutral individual, it had not been an easy decision for me to join the neighbourhood committee. However, my desire to serve was stronger than the negative feelings I had of grassroots organisations. Sadly, many capable and passionate people in my neighbourhood just refuse to step forward to serve because of the image of such organisations. I would like to suggest that the People’s Association (PA) be run like a civil service organisation in order to single-mindedly and unmistakably carry out its sole purpose of serving the people. Board members of the PA should not hold any political office. There is then no conflict of interests. 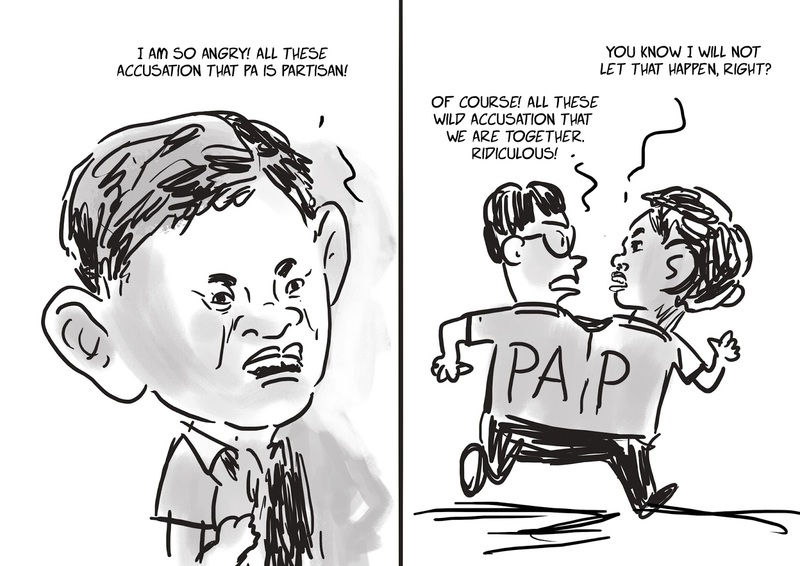 PAP MPs doing walkabout wearing PA shirts?